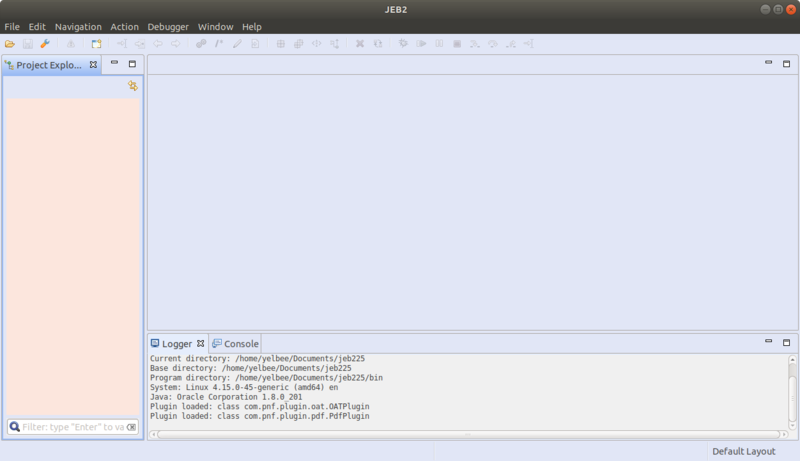 TO START WITH, we can see a picture showing the process from apk to java. To reach the final purpose of decompiling an apk, we may use some tools like apktool, dex2jar, enjarify, jd-core(jd-gui), cfr, procyon and etc. Apk could be regarded as a zip file and the DEX inside is the optimal Java bytecode recognized by Dalvik or ART in android system. Then, before cracking to get the source code of Java, DEX should be transfered to equilvalent JAR which wraps java class files. At last, using one of the java decompiler among cfr, jd-core and procyon, a JAR can be decompiled to java files that are very-close to the source project. However, we cannnot completely restore it and actually this is also a hard nut to crack in developing a practical decompiler. The picture below shows the difference between Jar file and Apk file. Class file is the same as dex file essentially and both of them are byte-stream code files. 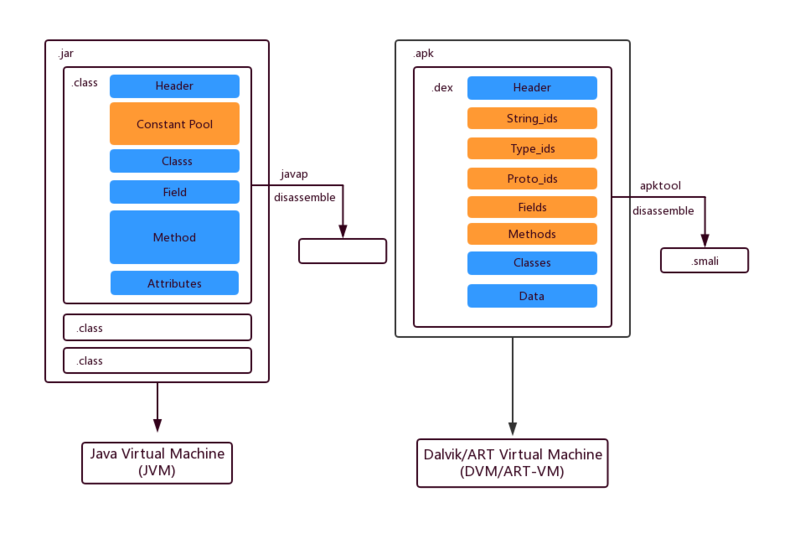 In other words, dex comes from class file because DVM or ART-VM are developed from JVM. We can use javap in JDK tools to disassemble class file and apktool to disassemble dex file. A tool for reverse engineering 3rd party, closed, binary Android apps. It can decode resources to nearly original form and rebuild them after making some modifications. It also makes working with an app easier because of the project like file structure and automation of some repetitive tasks like building apk, etc. Dex2jar is an older tool that also tries to translate Dalvik to Java bytecode. It works reasonable well most of the time, but a lot of obscure features or edge cases will cause it to fail or even silently produce incorrect results. By contrast, Enjarify is designed to work in as many cases as possible, even for code where Dex2jar would fail. Among other things, Enjarify correctly handles unicode class names, constants used as multiple types, implicit casts, exception handlers jumping into normal control flow, classes that reference too many constants, very long methods, exception handlers after a catchall handler, and static initial values of the wrong type. For normal use, you'll probably want to use the wrapper scripts and set it up on your path. A wrapper batch script, enjarify.bat, is provided. To be able to call it from anywhere, just add the root directory of the repository to your PATH. The batch script will always invoke python3 as interpreter. If you want to use pypy, just edit the script. Assuming you set up the script on your path correctly, you can call it from anywhere by just typing enjarify, e.g. The default output file is [inputname]-enjarify.jar in the current directory. To specify the filename for the output explicitly, pass the -o or --output option. By default, Enjarify will refuse to overwrite the output file if it already exists. To overwrite the output, pass the -f or --force option. 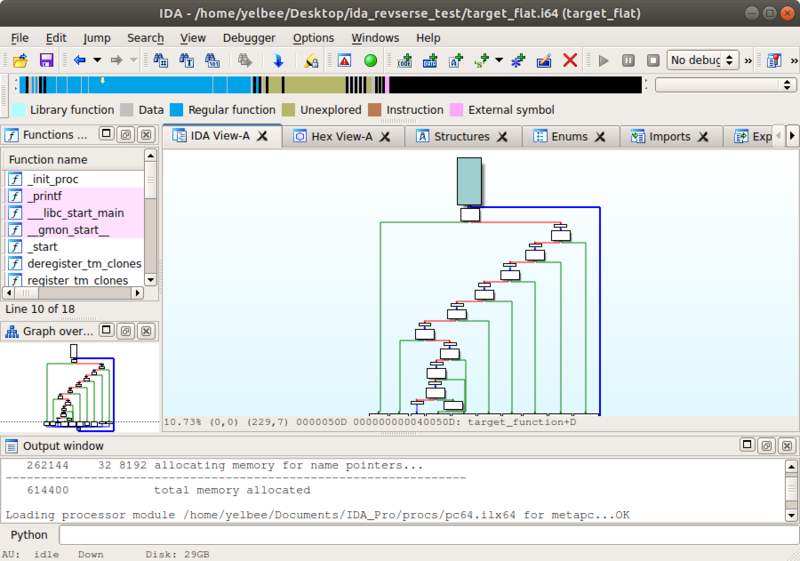 JD-Core is used by jd-gui as its java decompiler which is usually ignored. It's open-sourced and can do the decompiling job quickly. JD-Core-java is a thin-wrapper for the Java Decompiler. This is hack around the IntelliJ IDE plugin. It fakes the interfaces of the IDE, and provides access to JD-Core. CFR will decompile modern Java features - up to and including much of Java 9, 10 and beyond, but is written entirely in Java 6, so will work anywhere! (FAQ) - It'll even make a decent go of turning class files from other JVM langauges back into java. As a developer who splits his time between the .NET and Java platforms, I have been surprised and dismayed by the lackluster selection of decompilers in the Java ecosystem. Jad (no longer maintained, closed source) and JD-GUI (GPL3) are pretty decent choices, but the former does not support Java 5+ language features, and the latter tends to barf on code emitted by my LINQ/DLR tree compiler. To address the situation, I recently started developing a decompiler myself, inspired by (and borrowed heavily from) ILSpy and Mono.Cecil. Decompile and debug binary code. Break down and analyze document files. Dalvik, MIPS, ARM, Intel, WebAssembly & Ethereum Decompilers. You may find Some missing libraries while you starting the JEB and you can use sudo apt-get install command to fix it. You may get in trouble for some missing libraries while you starting the IDA.